We recently participated in a written interview for the SME magazine of one of our major Australian banks. The article was not all about us, so some of the input was edited to meet space restrictions. And we are posting the transcript here for those of you interested in Customer Lifetime Value and loyalty programs. It is best that the original Q&A structure is retained as seen below. Q: Please explain the theory behind customer lifetime value. The concept of customer lifetime value is quite simple; customers give you value by buying from you now and if you do a good job, buying from you again in the future. Lifetime value is the sum of these two cash flows. If your service makes it more likely that the customer will return in the future and spend again, you have increased the customer’s lifetime value. If bad service decreases the likelihood that they will ever come back, you have just destroyed future cash flow, or decreased that customer’s lifetime value to you. I first came across the concept in a book written by a Dallas Cadillac salesman in the 1980’s. He always personally delivered the car to a new customer, freshly detailed, with a full ‘tank of gas’ and a picnic basket in the ‘trunk’, paid for personally. A good investment as it turns out. The majority of his customers bought 3 cars from him in the next 6 – 8 years compared to the one sale enjoyed by his peers. They came back because they remembered the experience. He viewed each customer’s value as the commission he earned from 3 car sales, not 1, so he could afford to invest a little more up-front in the relationship. Consider the future potential of customers when you serve them, look past the current sale and think about what you can do to make future business more likely today. In fact, add up the value of your best customers for as far back as you can to get some idea of the potential value a new customer could have if they become a ‘best’ customer. Customers that remember you favourably are cheaper to attract – they do it of their own accord. Attracting new customers, strangers, is expensive. You have to advertise in some way and that is wasteful because you pay for the attention of a whole lot of people who do not become customers. At least you know customers needed your products once, which makes them qualified candidates, at the very least, better than mass marketing to strangers. Just don’t spend more on making them really happy than they will likely contribute to your profitability in the future, allowing for the fact that cash today is more valuable than cash tomorrow. Q: From an SME’s perspective, what are the benefits in considering existing and potential customers from a lifetime value perspective? Small companies cannot afford to view marketing as solely about conquest; common wisdom says that retaining a customer is 5-7 times cheaper than converting a stranger into a customer, for the same revenue. Understanding the differences in the profitability of business that comes from existing customers versus prospects really helps you balance the allocation of modest marketing budgets. Q: What is the latest thinking / best practice in loyalty marketing? Certainly for SMEs with repeating business, best practice is to understand the customer’s buying cycle so you can present a marketing offer at the correct time; when it is relevant because they are thinking of buying again. Give them a reason to not Google. Otherwise your email/flier/letter is spam. 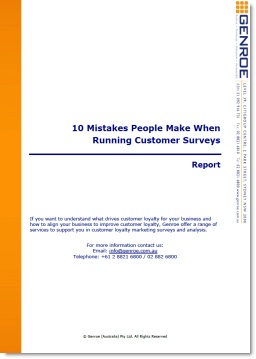 Q: What top five tips would you advise an SME to consider when embarking on a loyalty marketing program? Customer loyalty makes you more money than any other strategy. Think about what would make customers come back, at an acceptable cost, every day. The best loyalty program is to always have the best product at the cheapest price. Can you confidently do that and avoid bankruptcy? If you can, stop reading this article and start promoting! Loyalty marketing raises expectations of delivery quality for customers. Make sure you can deliver consistently to expectations; the customer backlash will be impressive but not pleasant. Do the numbers. As painful as it is, fire up Excel and work out how much extra you will make and how much it will cost you if you are successful increasing customer loyalty with your loyalty marketing. Personalized service becomes an entitlement in customer eyes instantly, so taking it away causes you angst. If you cannot see meaningful profits, be very careful. We can help you with these 6 tips, happy to, if you need it. Personalise! SMEs are supposed to be more personal, prove it. Large scale programs must treat you like a number. Relevant rewards are the key. Always reward the customer that takes up the referral as much as you reward the customer doing the referral. We all want to feel like we have done a favour, not profited from our friends. Q: Please give a good example of loyalty marketing? I have personally bought 3 cars from a single salesman. He calls to tell me when the residual lease value matches market value of the car. He does it for all of his SME clients because it saves them the trouble of renegotiating end-of-lease ‘stuff’. An electronic calendar and 2 phone calls have tripled my lifetime value to him, so far. First, I want to say that is an excellent and easy to read introduction to customer lifetime value LTV. One thing I would add to make the case even stronger is that free customer advocacy, most often in the form of good old-fashioned word-of-mouth or social networking, is also a key part of calculation in a customer’s lifetime value and the subjective quality of their experience.